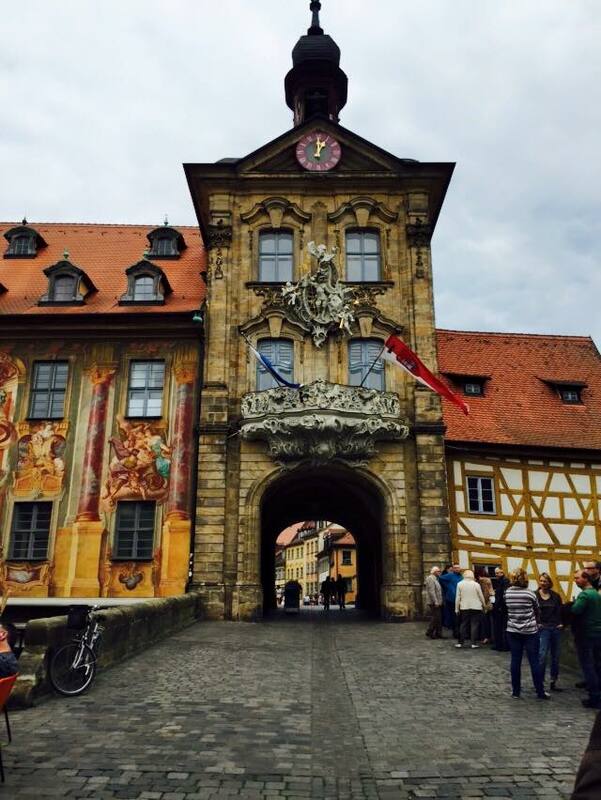 Bamberg is a small town in Bavaria, in the region known by proud locals as Franconia. Inscribed on the UNESCO list due to its Slavic connections, its architecture and its links with the 18th century Enlightenment, it is known among beer lovers for its sheer variety of brews in that beeriest of countries, Germany. 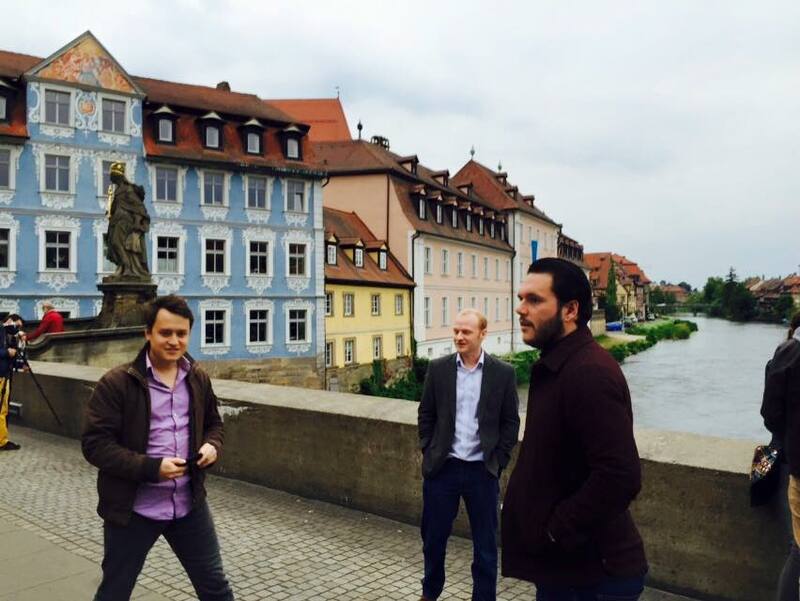 Ross, Nowell and I used one of the plentiful May bank holiday weekends to go to two WHSs in Bavaria: Bamberg and Würzburg. 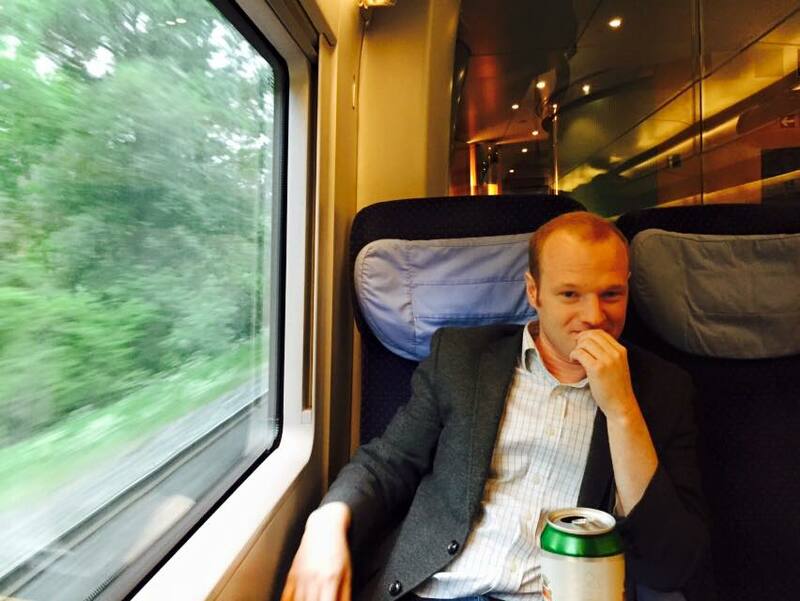 We flew into Nuremburg but spent no time in the city, instead heading straight for the station and catching a reassuringly expensive intercity train to Bamberg. 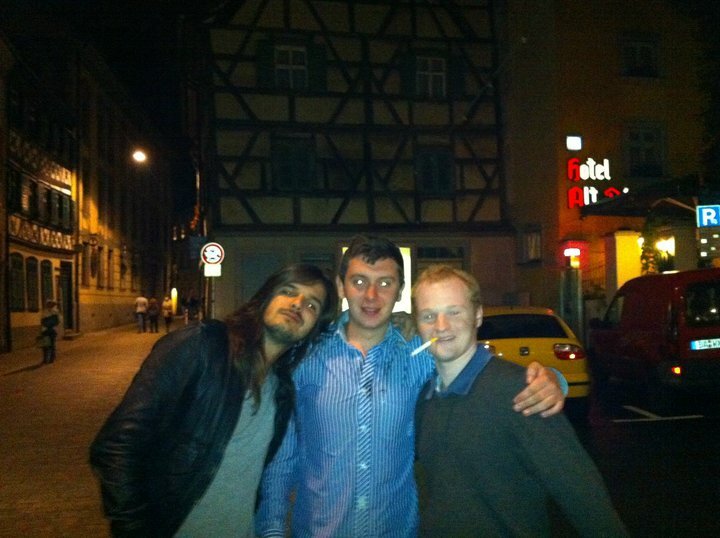 Upon arrival we met up with Ross’s English friend from Luxembourg, Danny, who has recently become a resident of Würzburg. 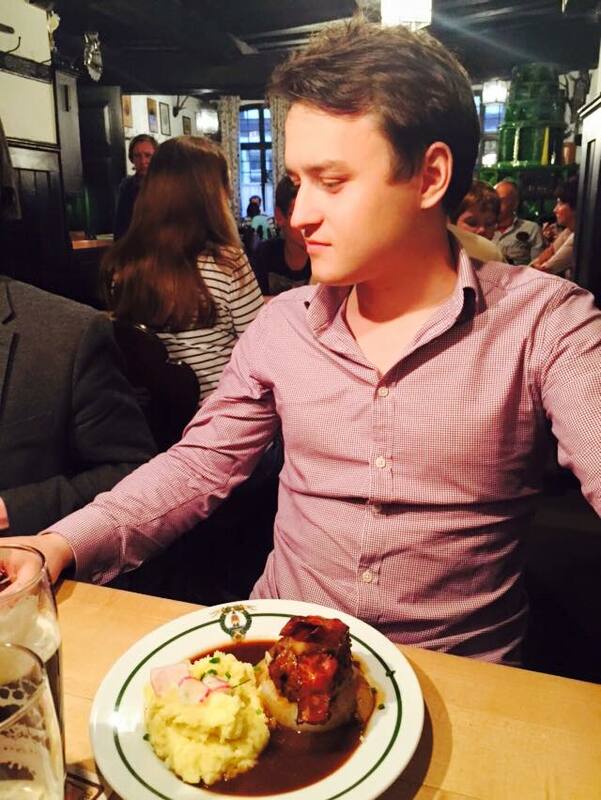 It was great having him with us as he is a fluent German speaker and a fellow Teutonophile for Nowell to get along with. He is a particular fan of the local fare, which not all of us can claim to be (there is only so much pork and sauerkraut that your average Brit can take). 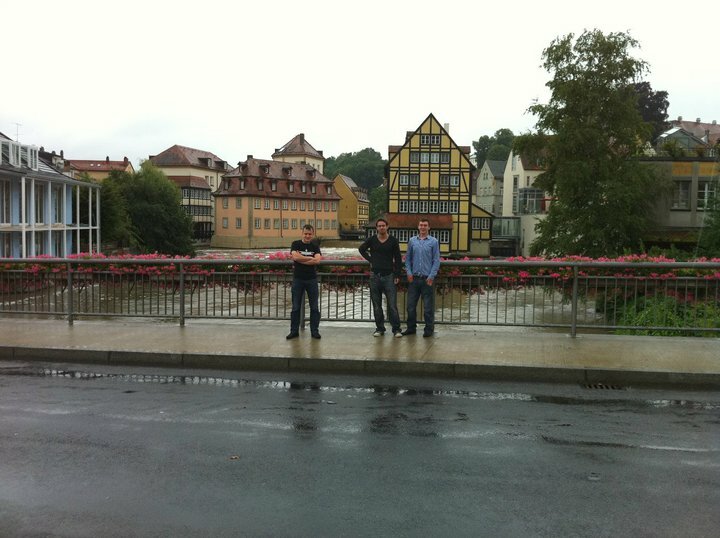 It so happens that this was our second trip to Bamberg – Ross, Nowell and I visited back in 2010 with a larger group of lads (back when we had more friends) on our way north from Munich to Berlin. Amusingly we seem to have posed for a photo in exactly the same spot on both trips – see if you can spot the differences below (apart from the fact that I am the only one appearing in both pics). 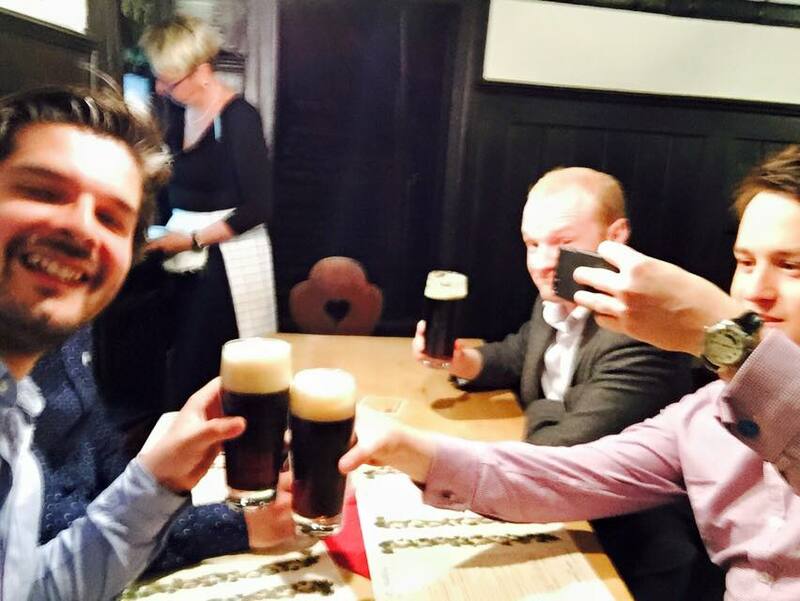 The most famous beer in Bamberg is the Rauchbier, which literally means ‘smoked beer’. Legend has it that a monastery once caught fire whilst its stores were full of barley. When they had put out the flames the monks decided it wasn’t worth putting it all to waste, so decided to go ahead with the next brew as planned. What resulted was a beer with a deeply smoky flavour, reminiscent – depending on your point of view – of anything ranging from a smoking a fine cigar to drinking a packet of used fags. Nevertheless, we got stuck in – and it was only I who moved swiftly back onto lagers and pilsners. 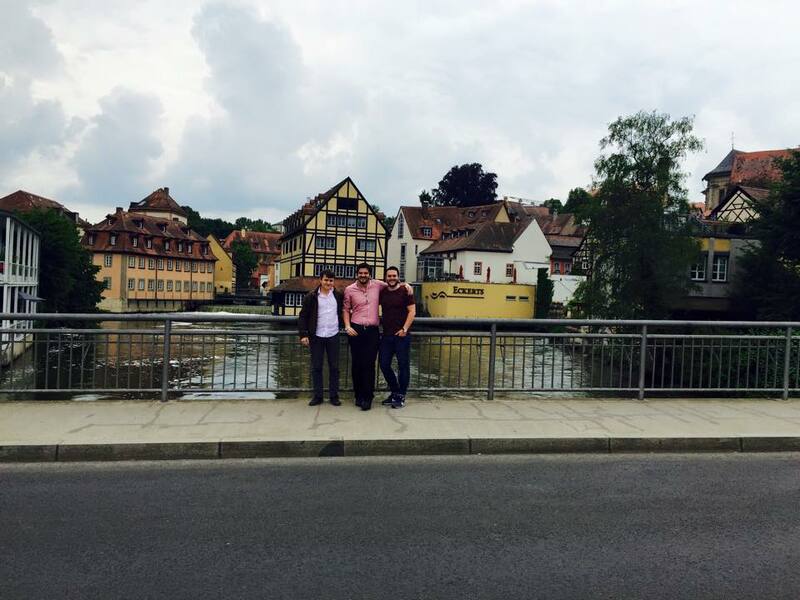 Bamberg is also known for its onions, apparently – something I only learned this time around. The town was where onions were first cultivated in Germany on an industrial scale, and their copiousness is presumably what led to the town’s local dish being a meat-stuffed onion, which you can see below. After a few more of the local drinks we were done – I can assure you there was no repeat of the excesses of our last visit when our younger selves were probably not the most considerate guests the town has ever known (though I’m sure they are pretty used to that kind of behaviour, being an out-and-out beer town). After a night in a ruinously expensive hotel we were well-rested and ready to take on some sightseeing (and light beer-drinking). One sight we completely missed last time around was the 13th century cathedral. 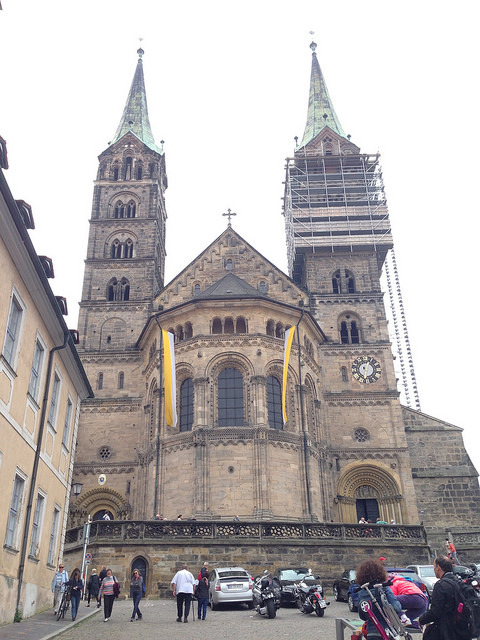 Bamberg has an important ecclesiastical past – indeed, it was at one point intended to become a ‘second Rome’, and assigned as the seat of a bishopric. The town is built around two rivers, so can feel a little Venetian (in fact there were a couple of gondolas plying their trade that we spotted). The medieval and baroque town houses and buildings are well preserved and most of the streets remain cobbled. Of all the buildings, the town hall, or Rathaus, is the most impressive to my mind. 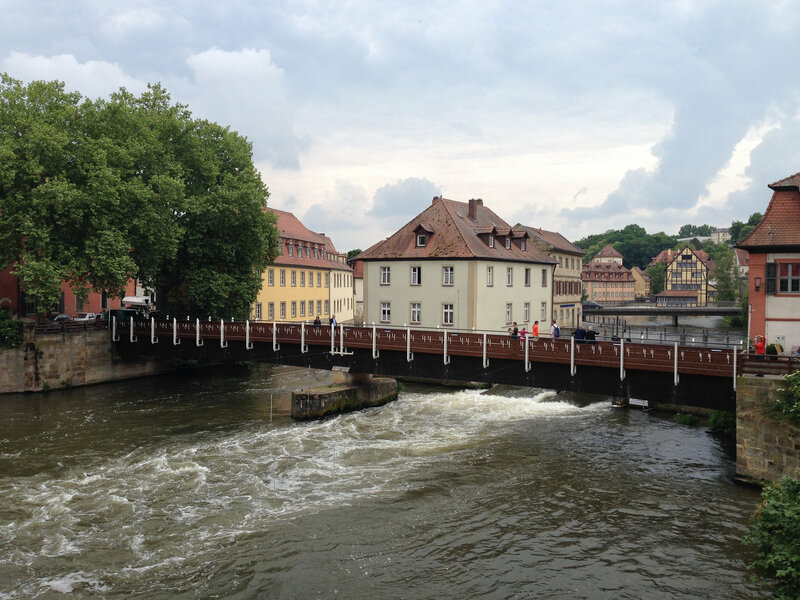 Although a pleasant town, if you are not a real beer afficionado seeking to check out the offerings of each of its 11 breweries, Bamberg is quite doable in one night. 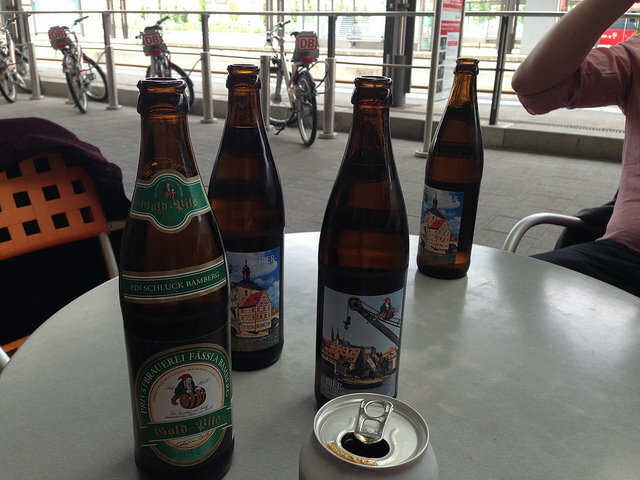 After narrowly missing the hourly train to Würzburg, we spent the time drinking local lagers and playing list-based drinking games on the platform … a finer activity on a summer’s day I haven’t yet found. This entry was posted in 2010, 2015, Germany and tagged europe, Germany, nowell, Ross, Tom on 2 June, 2015 by Tom Livesey.